Alrighty this blog post is the kick off point for a five part series on 3D printing. I am super excited about these postings. To get this 3D printing story started let's begin with how it works. Start by checking out this video. Its a 1-2 minute introduction that lays out the basics. When I explain 3D printing to teachers I often start by stating how there are two types of manufacturing: (1) subtractive manufacturing which is when you start off with a chunk of material and remove material with a tool such as chisel, drill or blade--think sculpting a statue out of a big granite stone; and (2) additive manufacturing which is when you add materials together to make an object. Of these two types, 3D printing is an additive process. As you saw in the video, liquid material is dripped onto a plate based on the measurements of a 3D model designed on the computer. If you think about it 3D printing has some similarities to printing a document on an office printer. The sheet of paper goes through the printer and ink is added to the paper based on the text of your word document. 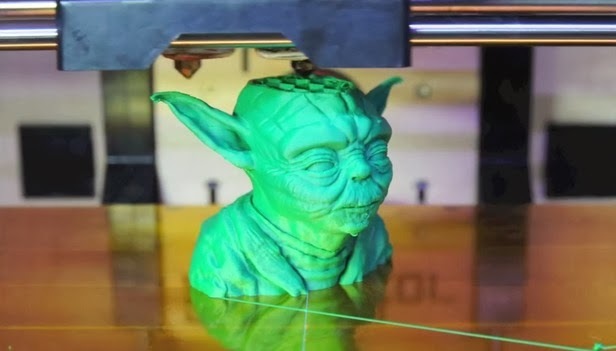 The big difference is a 3D printer takes the additive process to new heights by adding more and more layers that eventually create a standing 3D object like the Yoda statue above.